Insert a Coin - Choose a Vehicle - Take a Test Drive. 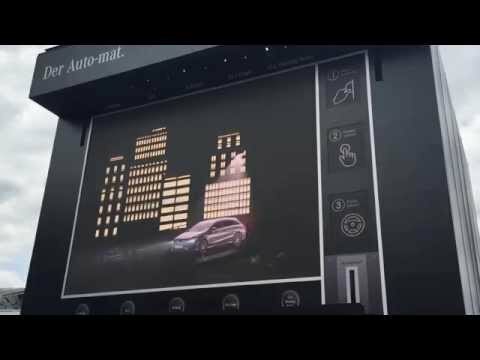 The Mercedes-Benz Auto-Mat promises the audience a different kind of test drive. In cooperation with Ambrosius, NUSSLI built an automat in XL format for the kick-off event in Frankfurt. At the same time, three smaller models in size S are out and about on the affiliated roadshow through 18 German cities. What looks like a gigantic machine with a coin slot, selector switch and display of five different Mercedes models on the LED display, is in reality, a hall with two gateways in a temporary structure. Within very short planning, production and construction phases, the NUSSLI assembly crew first built the XL machine with dimensions of 23 x 19 x 18.5 meters, and then three S automats, each measuring 2.5 x 2.5 x 5 meters, for the roadshow. The automats are still on tour until June 28th. In cooperation with Ambrosius, NUSSLI has built an automat in XL format for the kick-off event in Frankfurt. At the same time, three smaller models in size S are out and about on the roadshow through 18 German cities.